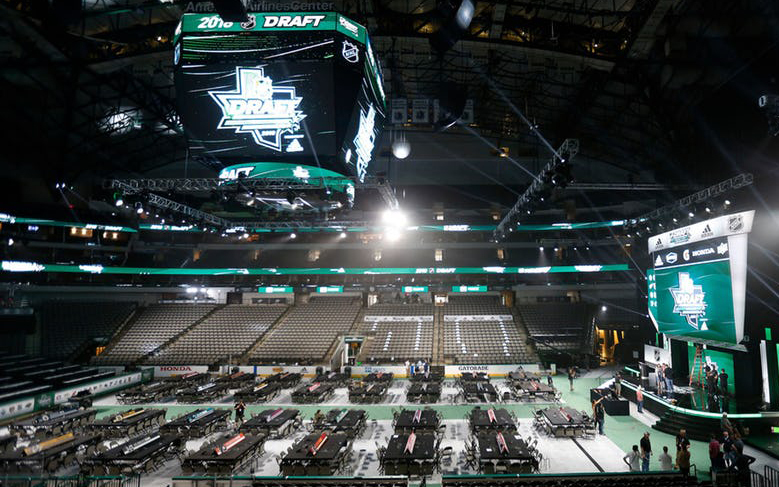 The NHL Draft arrives in Dallas tonight, as league execs and top prospects descend upon American Airlines Center to plot out the future of the league’s 31 franchises. A quartet of broadcasters are on-site covering it all, with NBC and NHL Network handling stateside coverage and Sportsnet and TVA delivering English and French coverage to Canada, as well as host of RSNs providing team-focused reports and live feeds. 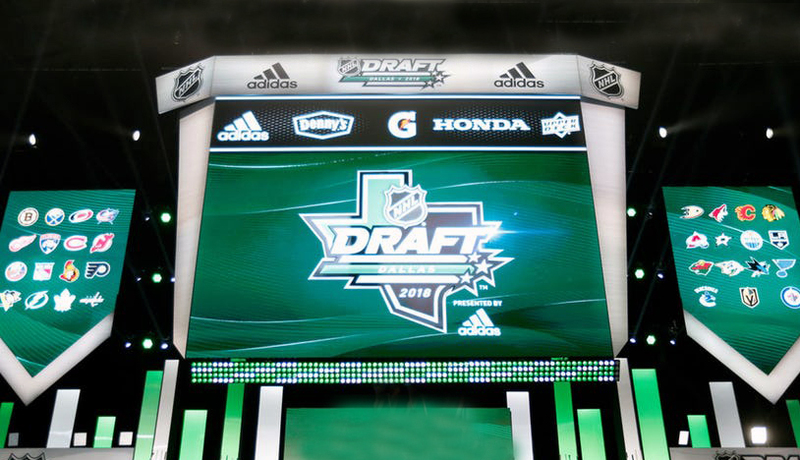 The NHL Draft will take over the American Airlines Center in Dallas for the next two days. The truck compound is populated with NEP’s ND5 for NBCSN, Game Creek Video’s Justice (NHL Network, which has exclusive coverage of Day 2), and Dome Productions’ Journey (Sportsnet) and Thunder (TVA), respectively. Bexel ESS is on-site managing broadcast infrastructure, while CAT Entertainment Services is powering the compound with primary UPS units and backup generators. Inside the arena, all four NHL broadcast partners’ sets are located at the back of the bowl looking towards the stage. According to the league’s VP of Arena and Event Operations Dan O’Neill, the size of the Draft continues to grow each year, with the four broadcasters rolling out more than 60 total cameras this year. After scoring the most-watched Stanley Cup Final in three years, NBC Sports Group is set for its fourth consecutive production of the NHL Draft. NBCSN’s production in Dallas will be based out of NEP’s ND5 – its primary NHL truck during the season (along with its sister truck ND6) – and be centered around the NHL on NBC desk used throughout the Stanley Cup Final. NBC has access to a total of 23 cameras and has deployed 14 unilateral cameras of its own, including five hard (two are high-speed), three handhelds (including one RF), two set cameras, and a “scoreboard snoop” camera, which shoots the board so the truck can easily reference picks that have already been made and time left on clock for each pick. NBC also has three beauty shots as part of its production philosophy to “stay live” inside the arena even when showing full screen graphics or lower-third graphics, according to Numme. NBCSN is also sharing three cameras with Sportsnet as world-feed cameras: an RF Steadicam, a jib, and a hard camera shooting the podium. In addition, Rogers allows NBC to take seven additional Q-Ball robos located on the seven Canadian team tables as splits from its truck. Numme says while the camera levels are similar to previous years, NBC’s coverage philosophy continues to evolve each year. Numme and company have coordinated closely with Rogers Sportsnet director Mike Mills and each selection will be choreographed using the three main world-feed cameras. The RF Steadicam will walk with the selection to the stage, the jib will continuously provide shots of either the stage or facing out at the tables on the floor, and the podium camera will capture whoever is on stage (i.e. commissioner, GM making a selection, or any guests). 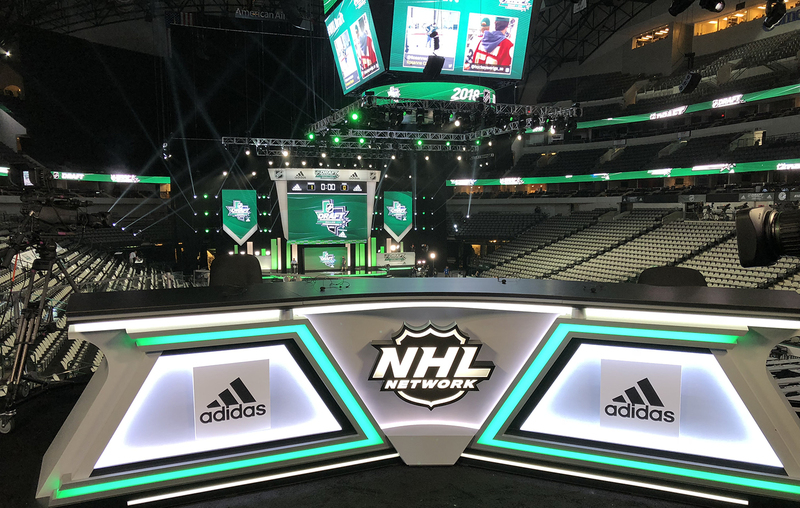 NHL Network is once again going all out at the draft, starting with an army of on-air talent and multiple on-site sets for live preview and recap shows on Day 1. Then, on Saturday, the network takes over for exclusive coverage of Rounds 2-7, which will also be streamed by NHL.com, and delivered to SiriusXM NHL Network Radio, Sportsnet, and NHL International. This year, NHL Network will debut a unique new graphic – dubbed the “Pick Tower” – to help viewers keep up with the ultra-fast pace picks on Day 2. The network is using the same desk it used for the Stanley Cup Final in Las Vegas – which is capable of having five guests at once – for its primary three-camera Draft set. On Day 1 of the Draft, the network will have an additional side set that is located on the arena floor, which will have two talent and one camera with the ability to have guests. On Day 2 of the Draft, NHL Network will take over the Sportsnet secondary set located on the floor at stage left, deploying two talent and one camera. NHL Network is once again using Zullavision RF monitors for its side set and reporter positions, which eliminates the need for wired monitors at the sets and allows a roving reporter to be able to see tape and program among other feeds. In terms of cameras, NHL Network will have the three cameras at its main set, one side set, two coverage cameras, and one RF camera, and an ENG camera for scenic shots and backstage interviews. NHL Network is using the same desk it used for the Stanley Cup Final in Las Vegas – which is capable of having five guests at once – for its primary three-camera Draft set. The network is also sharing multiple cameras from Sportsnet: one beauty cam (with a specialty fisheye lens), one jib, one podium camera. In addition, for the first time this year, NHL Network worked together with Sportsnet to ship equipment from the Stanley Cup Final in Washington, DC, to Dallas in order to save on shipping costs – a method NHL Network Manager of Remote Operations Lisa Litvack expects will continue in the future. Of course, the draft isn’t the only major event on the NHL calendar this week, as the NHL took over the Hard Rock Hotel & Casino in Las Vegas on Wednesday for the annual NHL Awards presentation. The NHL worked with Dempsey Productions to produce the world feed – which was carried by NBCSN and Sportsnet, and distributed to international broadcasters – utilizing an All Mobile Video truck. 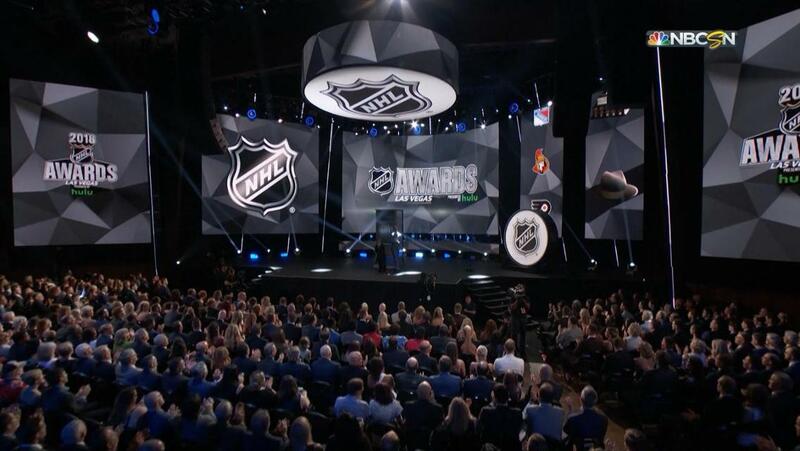 NHL Network was on-hand producing the pre-awards red carpet show and a post-show from the balcony of the theater. The operations team pre-cabled fiber from both positions back to a Peak Uplink, where the one-camera shows (featuring host Jamie Hersch and analyst Kevin Weekes) were produced. The truck was parked in the loading dock equidistant from both locations so the runs were between 400 and 600 feet. In addition to outbound transmission, NHL Network also brought in a satellite return for talent to see graphics and features.